Russian Translation: Theory and Practice is a comprehensive practical course in translation for advanced undergraduate and postgraduate students of Russian. The course aims to provide intensive exposure with a view to mastering translation from Russian into English while carefully analyzing the specific problems that arise in the translation process. popular culture – literature (prose and poetry), media, internet, humour, music. Central grammatical and lexical topics that will be addressed across the volume through the source texts and target texts include: declensional and agreement gender; case usage; impersonal constructions; verbal aspect; verbal government; word order; Russian word formation, especially prefixation and suffixation; collocations and proverbs; and abbreviations. 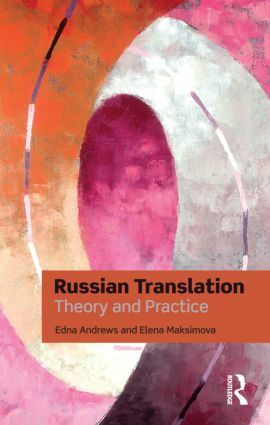 Russian Translation: Theory and Practice is essential reading for all students seriously interested in improving their translation skills. A Tutor’s Handbook for this course, giving guidance on teaching methods and assessment, as well as specimen answers, is available in PDF format from our website at http://www.routledge.com/books/Russian-Translation-isbn9780415473477. Edna Andrews is Professor of Linguistics and Cultural Anthropology, Director of the Center for Slavic, Eurasian and East European Studies at Duke University, USA. Elena Maksimova is Associate Professor of the Practice in the Department of Slavic and Eurasian Studies at Duke University, USA.